find that I had also won the BDO Award at this year’s convocation,” admits Choo Yau Sean (Nilai University BA (Hons) in Accounting and Finance). He was referring to the prize awarded by BDO Malaysia, a member firm of BDO International, the world’s fifth largest network of professional services firms. 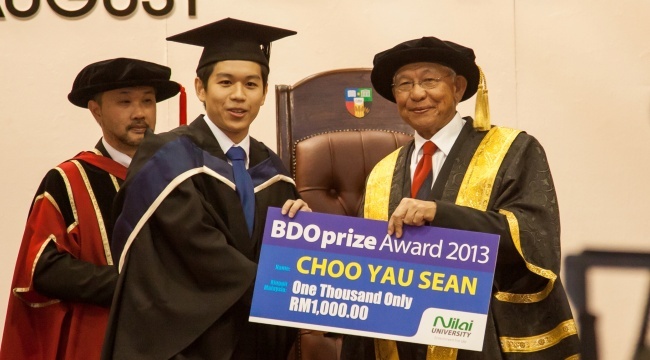 Given out annually, the BDO Award, comprising RM1,000 in cash, is granted each year to the student graduating with B.A. (Hons) in Accounting and Finance degree at Nilai University, obtaining the highest CGPA in the programme. The prize win was unexpected given that the Klang native very nearly ended up as an engineer having selected engineering subjects in his pre-university programme at another private university in Subang Jaya. But everything changed when Nilai Universty (Nilai U) offered the young lad a High Achiever Scholarship covering his entire tuition and accommodation fees. This was due to his exemplary results in SPM (10As and 1B) and also in his pre-university South Australian Matriculation programme. At that point, he made the bold decision to opt for the accounting and finance degree at Nilai U. “In the beginning, I must admit to being quite miserable as I had no friends in Nilai U. Also, I was finding the programme quite tough as I had no solid foundation in accounting,” says the 21-year-old. studies, Yau Sean managed to catch up with his classmates and soon began to find his footing in the programme. “I have to thank the lecturers for guiding me. Nilai U lecturers always have time for students and go to great lengths to ensure that everyone understand the lessons. studies,” says Yau Sean. He did not suffer socially for long either as his outgoing personality saw that he soon made plenty of friends. “I encourage all students to join in the extracurricular activities as it is the best way to make new friends. It also helps fill your time after class and these activities help you blow off steam. I believe having an active social life on campus is crucial to a student’s success,” he counsels. Yau Sean busied himself with basketball and volleyball as well as jogging daily around the lakeside trek and around Nilai U’s picturesque campus. “Sports instilled in me a strong sense of discipline and willpower. Yau Sean says he has no regrets switching courses and joining Nilai U. “The campus is so peaceful and quiet which is perfect for studies. Also, staying on campus, there is no hassle getting to class on time. At my previous place of study, I had to get up as early as 5am just to secure a parking spot. I have even had my car towed way for illegal parking and that is just stress I can do without,” he frowns. Nilai University’s 105-acre campus has excellent sporting facilities to keep student fit and healthy. In the meantime, Yau Sean is keen to carve a career as a chartered accountant. With his degree offering seven exemptions from Association of Certified Chartered Accountants (ACCA) exams, he is keen to complete this portion of his professional training as soon as possible, perhaps with backing from a big accounting firm. Having won the BDO Award, Yau Sean is hopeful that he will receive a job offer from the prestigious firm. “Winning the prize is probably the best pitch for a job with BDO International. I hope they make me an offer and I am sure I will not let them down,” he says. Given his positive approach and never-say-die attitude, it’s almost a given that this young man will succeed in achieving his goals.